Vitamin K plays a vital role in helping the blood clot, preventing excessive bleeding. Unlike many other vitamins, vitamin K is not typically used as a dietary supplement. Vitamin K is actually a group of compounds. The most important of these compounds appears to be vitamin K1 and vitamin K2. Vitamin K1 is obtained from leafy greens and other vegetables. Vitamin K2 is a group of compounds largely obtained from meats, cheeses, and eggs and synthesized by bacteria. Vitamin K2 is an essential vitamin that most people do not hear about until they have their first child and the nurse administers a vitamin K injection. Sadly, this essential nutrient is often overlooked, and it is important at all life stages – not just for newborn babies or pregnant moms. Other vitamins and minerals – like vitamin D, magnesium and calcium – receive the attention they deserve, but K2 is often ignored with dire consequences. Let’s find out what makes vitamin K2 so important to a healthy lifestyle. Vitamin K is an essential fat-soluble vitamin that plays in important role in bone and heart health. 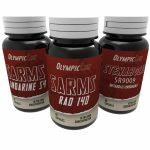 It is one of the main vitamins involved in bone mineralization and blood clotting, plus it also helps to maintain brain function, a healthy metabolism and protect against cancer. 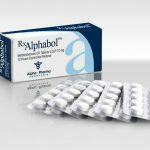 According to researchers from Mid America Heart Institute at Saint Luke’s Hospital, research has shown that vitamin K is an “anticalcification, anticancer, bone-forming and insulin-sensitizing molecule.” It’s many protective effects make it one of the best vitamins for adult men and women. We hear a lot about the benefits of omega-3 fatty acids and antioxidants – like vitamin C or vitamin E – for preventing heart disease, but recent studies suggest that vitamin K is also one of the most crucial vitamins for preventing cardiovascular diseases. Studies have shown that individuals who increase their intake of dietary vitamin K have a lower risk of cardiovascular disease and stroke mortality. This is one reason why preventing vitamin K deficiency by eating a healthy diet can be so protective. Vitamin K1 (or phylloquinone): is a natural form found greens that are used by the liver for proper blood clotting. Vitamin K2 (or menaquinone): is a more absorbable form of vitamin K found in certain fermented foods and supplements and is used by soft tissues and is helpful for bones, heart tissue and more. Vitamin K3 (or menadione): is a synthetic form of vitamin K. This is typically the one injected into infants at birth, and some studies have shown potential toxicity from this form. The main function of vitamin K is modifying proteins to give them the ability to bind calcium. Vitamin K1 is mostly used by the liver to activate calcium-binding proteins involved in blood clotting, while K2 is used to activate proteins that regulate where calcium ends up in the body. According to Healthline.com, calcium build-up in the arteries around the heart is a major risk factor for heart disease. For this reason, anything that can reduce this accumulation of calcium may help prevent heart disease. This is where vitamin K2 is believed to help, by helping to prevent calcium from being deposited in the arteries. In the Rotterdam study, those who had the highest intake of vitamin K2 were 52 percent less likely to develop calcification of the arteries and had a 57 percent lower risk of dying from heart disease, over a seven to 10-year period. Another study of 16,057 women found that participants with the highest intake of vitamin K2 had a much lower risk of heart disease. For every 10 micrograms of K2 they consumed per day, the risk of heart disease was reduced by nine percent. It should be noted that vitamin K1 had no influence in either of these two studies. Humans can partly convert vitamin K1 to K2 in the body. This is useful because the amount of vitamin K1 in a typical diet is 10 times that of vitamin K2. According to the National Center for Biotechnology Information, vitamin K2 is also produced by gut bacteria in the large intestine, and there is some evidence that broad-spectrum antibiotics can contribute to K2 deficiency. Vitamin K2 can be found in foods, such as cheese, egg yolks, butter, fermented foods, and liver. In a study conducted in The American Journal of Clinical Nutrition, vitamin K2 supplementation reduced prostate cancer risk by 30 percent, whereas K1 had no effect. 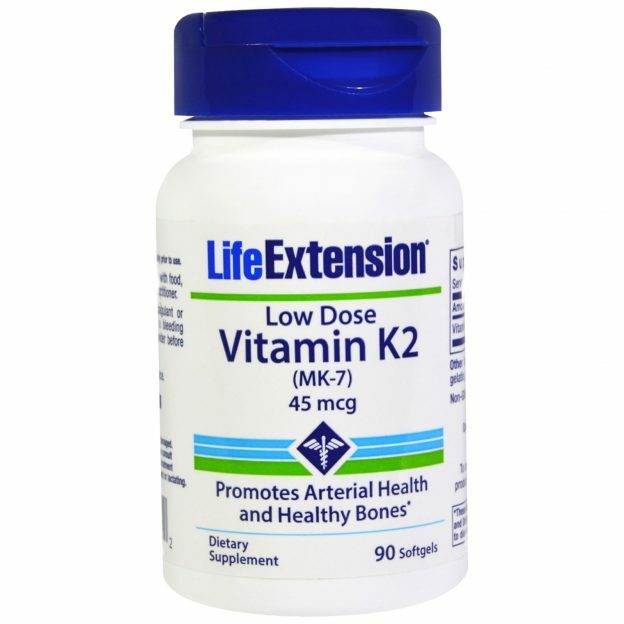 The forms of vitamin K2 that humans are most deficient in are the MK-7 and MK-4. MK-7: is produced inside our gastrointestinal system. We can get MK-7 from fermented foods. 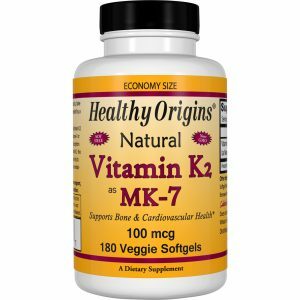 MK-7 is also considered to be very effective in terms of supplementation, as it lasts for roughly three days in the bloodstream. MK-4: is synthesized throughout the body from enzymes – being exceptionally high in the brain and reproductive organs. We can get MK-4 through diet by consuming grass-fed animal meats (grain-fed does not contain MK-4). You can also supplement with MK-4, but it only lasts for roughly eight hours in the bloodstream, and therefore is considered to be worse for supplementation than MK-7. Vitamin K2 (MK-4) is used for steroid production in the male testis. Studies in rats have showed that a diet providing 75 mg/kg of MK-4 enhanced testosterone levels. Vitamin K2 has been shown to help with the removal of calcium from the lining of your blood vessels, as well as the redistribution of that calcium back to your bones. Without adequate levels of K2, this process is inefficient and can lead to bone and cardiovascular health issues. This connection has led many health professionals to recommend K2 supplements to those who are already taking bone health supplements like vitamin D, calcium and magnesium to ensure the calcium is transported to where it’s supposed to go – your bones.